After the recent blast of wintry weather, it’s hard to believe summer is on the way, but it will be here before you know it. Now’s the time to get ready. 2) Clean filters. Whether your air conditioner is old or new, clean your unit’s filter. Do it before turning it on and then periodically after that. It’s an easy way to improve the unit’s performance and to save energy. 3) Make sure your AC is sized properly for the space to be cooled. Contrary to popular belief, a larger unit will not cool a room better. A properly-sized unit will be more efficient, and it will keep the space at a constant temperature and a comfortable humidity level. If you need help sizing, use this handy chart as a guide. 4) Replace the old thermostat. If you want more control of your energy bills this summer, replace your old thermostat with a programmable one. Even better, get a smart thermostat, which can cut your heating and cooling costs by up to 20 percent. 5) Inspect your screens. An evening breeze can help cool off your home after a hot summer day. Check your window and door screens to make sure they’re not dirty and/or in need of repair. Also, tighten and lubricate hinges and closers. 7) Locate and seal air leaks. This summer, keep your air conditioner—and you—from working overtime by checking your windows, doors and floors for hidden gaps and cracks. They can bring in as much steamy air as an open window, making your cooling system work harder than it should. Ensure cool air can’t escape by sealing leaks with a caulking gun or weather-stripping tool. 8) Check insulation. 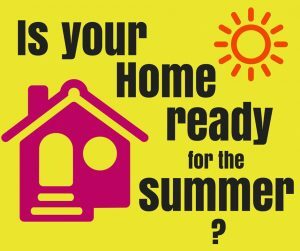 Beating the summer heat—and high energy bills—will prove difficult if your home lacks the recommended amount of insulation. Look across your attic floor: If the insulation is even with or below the attic floor joists, it’s time to add more. 10) Dust off the grill. Die-hard grilling enthusiasts are tempted to cook outdoors in the middle of a blizzard, but for the rest of us it’s time to get the grill out of the garage and ready for backyard barbecues. (Tips on cleaning the grill here and here.) Since grills keep heat out of the kitchen, air conditioners don’t have to work extra to cool it off. Grilling is a great way to cut costs—and spend time outdoors. Bonus Tip: Give your linens a makeover. Say goodbye to the heavy flannel sheets that kept you toasty warm in the winter, and say hello to lighter linens with solid, light colors. This will help you keep comfortable in the summer, without having to blast the air conditioner. For great fact sheets on improving efficiency in your home, please visit CUB’s Efficiency page.